Competition in the compact crossover segment is probably as fierce as it has ever been, based on the sheer numbers of buyers flocking to SUVs over sedans and minivans. The 2018 Ford Escape and the Chevy Equinox are two of the biggest names in the market right now, so let's see how they shape up against each other. People buy crossovers because they like them, because while SUVs are functional, they're not the most practical vehicles out there. If you're looking for pure practicality, you're likely looking at trucks or minivans or even commercial vans. But SUVs play to our desire to be cool and to drive something that makes us feel that way--and crossovers do just that. The Ford Escape is a good-looking, sporty crossover and its recent refresh has sharpened things up very nicely. The Escape is not jaw-droppingly gorgeous, but it won't offend anyone with how it looks. The Equinox got a massive redesign last year when it adopted the modern, aggressive styling of other Chevy models such as the Malibu and Cruze. When you look at the Equinox, you'll see a decidedly more premium approach. It acts like it's more expensive than it is, which lets you do the same. If we're talking about purely aesthetics, the Equinox wins over the Escape. We like crossovers so much because they look like SUVs but drive more like cars, and that's certainly the case with the Ford Escape. To some, the Escape looks like a tall hatchback, and it certainly drives and handles like one. All three engines available in the Ford are four-cylinder gas units but they do cover a decent spectrum of performance. The Chevy Equinox also has three engine options but one of them is a diesel. The two gas engines offered are very similar to the two most powerful of the Ford engines, but the transmission and handling in the Chevy don't make the most of that power in quite the way the Escape does. If what matters to you most is how well you can get around without thinking too much about it, the Escape gives you just that. Although the Equinox is the longer and wider of the two vehicles here, you'll be amazed at how much more spacious the Escape is on the inside. There's just 90 cu.-ft. of passenger volume inside the Chevy which is trumped quite dramatically by the 98.1 cu.-ft. of the Ford. You'll get three additional inches of leg room in the rear of the Equinox, but the Ford has more room in the front seats and more cargo space throughout the cabin. If one of your reasons for choosing a crossover is interior space you'll definitely find the Ford to be the winner in this area. There are four well-equipped trim levels (S, SE, SEL and Titanium) in the 2018 Ford Escape lineup, and there are plenty of options for upgrading where you see fit. The base model comes standard with a rearview camera, power features, cloth seats, air conditioning, cruise control, 17-inch wheels, an AM/FM/CD player with six speakers, and Ford's Sync infotainment control system with a 4.2-inch center screen. The Chevy Equinox has also been updated to include better levels of standard equipment than it used to have, sitting about equal to the Ford Escape. 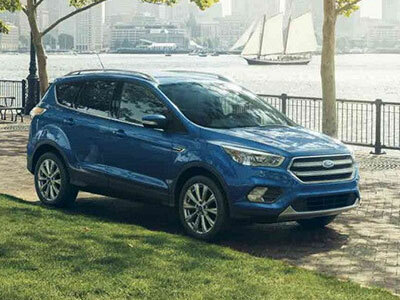 The Ford Escape and the Chevy Equinox stand toe-to-toe in the market, competing for the same buyers who are looking for a lot of the same things. Obviously, they're close and it may come down to personal preference when you decide. However, before you decide consider the fact that the Ford Escape offers more passenger room, better performance, and an impressive base package of features. For us, the way the Escape drives and handles makes it our choice.